Give your guitar tone more growl than a grizzly. 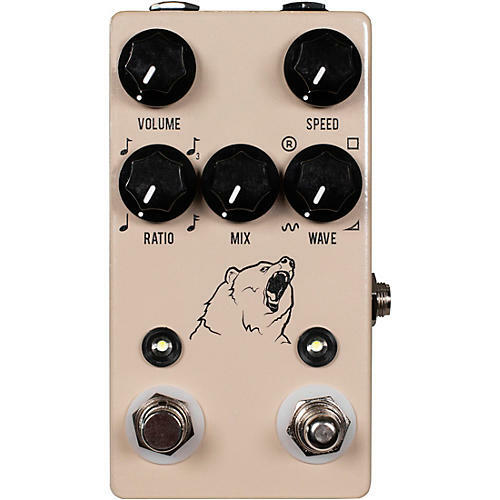 Part of JHS Pedals' tap-tempo series, the Kodiak Tremolo effects pedal features all the bells-and-whistles you need to create the biggest tremolo growl. Based around classic Vox and Black Face tremolo sounds, the Kodiak brings vintage tremolo into the modern era with four different wave patterns, onboard tap-tempo, and sub-divisions to give you total control as well as plenty of inspiration to bring your sound out of hibernation. Let’s take a look at all the features this brown beast bears. The Kodiak has five simple controls: Volume, Speed, Mix, Ratio, and Wave. The Volume control enables you to set the overall volume however you like it – either dialed back, at unity or boosted. The Speed knob is a manual control for the speed of the tremolo, which you can also set with the onboard tap-tempo switch. The Mix knob controls how deep the tremolo is perceived, from fully clean to fully wet. A great feature of the Kodiak is that you can turn the Mix knob all the way down and use the Volume to boost your amp or other pedals, acting as a preamp or slightly driven boost. The Ratio control gives you the ability to dial in faster speeds that are perfectly synced with the BPM of your tap. You can choose from quarter notes, eighth notes, "triplets", or sixteenth notes. The Wave control gives you four different wave variations to choose from: Sine, Rhythmic, Square, and Ramp. The Sine wave is a classic amp-like tremolo sound, the Rhythmic wave gives you an interesting rhythmic pattern that can be used in many different time-signatures for a different effect, the Square wave gives you a more choppy trem sound, and the Ramp wave gives you a warbly type of sound. With all these options, sit down, grab a jar of honey, and spend lots of time with your new bear-friend to really get to know what it has to offer. Dimensions: 2.6" x 4.8" x 1.6"
Go wild with the Kodiak Tremolo. Order today. Dimensions (WxLxD): 2.6" x 4.8" x 1.6"